To those who know, hedge fund manager J. Kyle Bass needs no introduction. “Something that I think is really important to pay attention to; in the last ten years, debts around the world… has grown from $80 Trillion to just over $200 Trillion. So debts have grown, at almost an 11% compound annual growth rate, over the last ten years. We sit today at the largest peacetime accumulation of debt in world history. This observation serves as solid justification for the concerns that Senator Barnaby Joyce has, for some years now, been expressing (to much derision by “experts”) about ever rising sovereign debt – the “trajectory”, as he calls it – in the USA, Europe, and in turn, here in Australia. Finance has grown too big around the world and cross-border lending too large, according to BIS chief economist Stephen Cecchetti. In Australia, the finance sector accounts for 11.5 per cent of all industry value added, having doubled its share of the economy since the mid-1980s. The extraordinary dimensions of Australia’s banking sector were highlighted by Bank of America Merrill Lynch research last week showing that Australia has the second-largest banking system in the world by market capitalisation, surpassing those of the eurozone, Japan, Britain and China. It is absurd for a nation of 22 million to have a banking sector that represents more than 8 per cent of the world banking industry by market value. Banking now represents just under half Australia’s listed market. There are two important observations here that I wish to highlight. The first is Bass’ concern over private sector (ie, banking system) “leveraging” (ie, mega-debt) being transferred on to the public (taxpayer) sector, in a banking system crisis. This is the #1 reason why, even though it is true that private debt is much worse than public debt, I believe that Barnaby Is Right in constantly expressing concern over the rapidly rising trajectory of public debt in Australia. Because, regardless of whether or not you agree that our public debt is “low compared to other OECD countries,” the undeniable fact remains that our rapidly rising government debt does represent a weakening of the government’s balance sheet… even before any banking crisis arrives! Foreseeing that our banking system was, just like the rest of the West, our key vulnerability, and that weakening the government balance sheet unnecessarily would only make our future problems far more calamitous, was one of the main reasons why I launched this blog in early 2010. When you hear some distinguished-looking, eminent economic “expert” – or politician – reassuring us that Australia’s public debt is “low”, just keep one word at the front of your mind. Ireland. And remember what happens to the public debt level, when a government with previously “low” public debt suddenly finds itself borrowing to the stratosphere – often from the IMF – in trying to bail out an over-leveraged banking system. The second important observation – on GDP as a “homogenizing denominator” – is one that thrilled your humble blogger, and made him feel a lot smarter than he actually is. How so? (c) governments should be required to report key budget figures like government spending, and public debt, as a percentage of government tax revenue instead. Bass is both subtle and brilliant, in describing GDP as a “pretty good homogenizing denominator”. One definition of that word is: “to form by blending unlike elements”. That’s exactly what the GDP figure does – it blends unlike elements. It is a meaningless quantitative measurement, that simplistically blends together every transaction in the economy in one huge number (all the better for making things like government spending or debt “as a percentage of GDP” sound like a small number). In so doing, it obscures any qualitative measurement of activity in the economy. That is, unlike “GDP”, a qualitative measurement would distinguish between the volume x value of transactions resulting from real, productive activities, versus that which resulted only from (eg) non-productive money-shuffling between financial institutions. In theory, an economy could boast a China-like level of annual GDP “growth”, while actually producing nothing. All it takes to achieve that, is a sufficient increase in the volume x notional “value” of electronic digits that are transacted each year. “GDP” as a measurement is utterly ridiculous, once you see it for what it is. This blogger can greatly appreciate the wisdom of Kyle Bass and his hedge fund team, in choosing to assess economies based on a recognition that “certain countries are much more productive than others”, and that GDP as a measurement does not help to identify which countries have quality (ie, productive) activity, and which do not. “When your debts get to be 20, 25 times your central government tax revenue, a non-linearity develops between your revenues and your expenses. So if you try to inflate your way out of this problem which – again, the academics, the central bankers of the world believe that when you get to this proverbial fork in the road, that fork is either inflate or default, and those two roads are mutually exclusive of one another – we tend to think that 90% of the time one causes the other. And when you develop this non-linearity… when your debts are 20 times your revenues and you try to inflate your way out of this through revenue, it moves your swaps curves or your debt costs, ok? Your expenses grow exponentially while your revenues grow in a linear fashion … it just makes sense, this is logic. Oh dear. Remember, this talk was given in October last year. As of March this year, the government of Japan has moved to an inflation bias, after 15 years of deflation. They have set the central Bank of Japan a 2% target for inflation, to be achieved within two years. “They’re not going to tell you when this happens, you’re going to have to see it for yourself. How many of you remember Mexico in ’94 when we had the ‘Tequila Crisis’? The government gave affirmative determinations that they would not devalue, they would not default, almost daily. And the day after they said we won’t devalue, they devalued 60%. The government’s never going to tell you that it’s going to happen. (Greece’s) Yunker, when asked in 2010 if there was a secret meeting to discuss restructuring Greece, he said: ‘Oh no, there’s no meeting’. And then they talked to two other Finance ministers the next day, and they said: ‘Oh yes, we had a meeting and Yunker was in there’. And so the press went back to him and said: ‘You told us there wasn’t a meeting’, and he said: ‘Look, when it becomes serious, you have to lie’. Japan is our second largest trading partner, last time I looked. This too, impressed me. And made me feel smarter than I am. How so? Fundamental to my own alternate currency system idea, is the view that gold (or any other ‘commodity’ whose stocks, supply, or public reporting of reserves can be manipulated) should not be used as the basis for a future currency system. And – per Kyle Bass – my idea ties currency issuance directly to population size. See The People’s NWO: Every Man His Own Central Banker. Watch the whole talk, on Youtube. Highly recommended. David Murray Shows The Greens And MSM Are Clueless. Again. Former chairman of the Future Fund, David Murray, ruffled lots of establishment feathers during his tenure, particularly for his scathing criticism of the Warmageddonist movement. Now, he has shown up the Greens – and, the entire lamestream economics and political media contingent – with his astute comments about the real reason why the government must balance the nation’s books. Mr Murray, former chairman of the nation’s $73 billion sovereign wealth fund and a former Commonwealth Bank chief executive, said he was concerned about the Greens’ suggestions that curbing government spending was not important, given the woes in the global economy and the size of the blow-out in the budget at the peak of the global financial crisis. 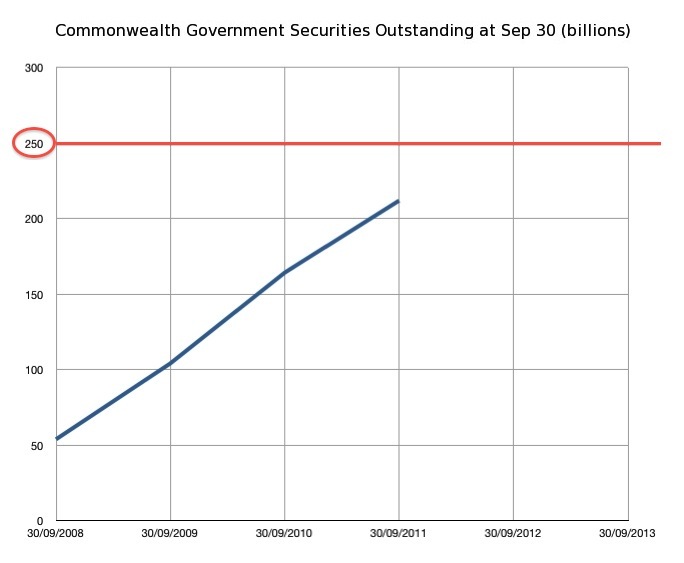 “What’s at risk here is that with very significant offshore borrowings and a shaky world for raising capital, if the commonwealth in particular can’t hold its ratings, that will affect the ratings of the banks, that will affect the cost of debt, and it also means that the commonwealth is not there in the same measure as a backstop if things go wrong again and the banking system can’t fund itself offshore,” Mr Murray told The Australian. As we have seen here at barnabyisright.com for many months now, the government (and the economy) are now trapped by the errors and abject stupidity of the past. The credit ratings agencies have put our government on notice that the credit rating of the government – and more importantly, of the banking system – is contingent on the government showing a credible path back to balanced budgets. Why? Because in the GFC, the government explicitly and implicitly guaranteed our hugely overleveraged, foreign-debt dependent, housing market exposed banking system, using the sovereign balance sheet. If the government can not promptly curb its ever-rising debt and deficits, then the government guarantee propping up the banks will lose credibility. On the other hand, if the government does attempt to achieve an actual surplus in 2012-13, and not just a forecast for one on May 8th, that spells disaster for the economy too. See for yourself – Labor’s Inbred, Debt-Fed Chickens Coming Home To Roost. We are Ireland Mk 2. 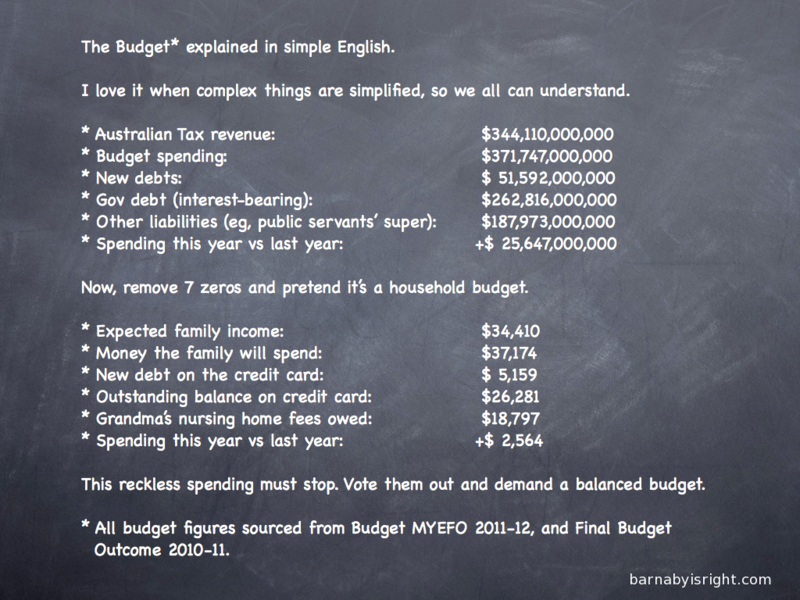 Twitter follower @cr0atz recently brought to my attention an interesting picture of the US budget made simple. He asked me to make an Aussie version. Now don’t let anyone tell you that debt and deficits don’t matter. Or, that government and household budgets are “different”. Those spruiking such claims – their ideological Articles of Faith – are the same “experts” who didn’t see the GFC coming. And now, can’t fix it either. For weeks … months in fact … there’s been plenty of fevered speculative commentary about China sailing to Europe’s rescue, by using their vast foreign exchange reserves to buy up European sovereign debt that the markets increasingly distrust (thus, ever spiking interest rates). China’s vast foreign exchange reserves may not be so vast after all. Europeans searching for a bazooka to blast away eurozone debt problems might well eye China’s US$3.2 trillion foreign exchange arsenal with envy, but Beijing has far less firepower available than many assume. Most of money in the world’s biggest store of foreign exchange reserves is prudently kept in near-cash instruments to fund import and debt service bills in the event of an unforeseen domestic emergency, or invested in long-term assets that, if sold in size to help Europe, would spark panic on global financial markets. In fact, analysts reckon China’s armory has only about US$100 billion to spare. “The sheer size of China’s foreign exchange reserves is massive, but the actual amount of money available for investing in Europe each year isn’t that big,” said Wang Jun, an economist at CCIEE, a top government think tank in Beijing. A crucial constraint is China’s existing holdings of U.S. Treasury securities. Beijing is by far the biggest foreign owner, with an estimated 70 percent of the nation’s reserves held in U.S. government bills, bonds and other dollar assets. 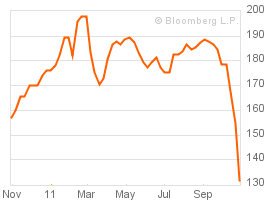 Turn outright seller and the market value of the remaining holdings is likely to plunge. That’s not a great investment strategy given the Chinese public’s unhappiness about the roughly 38 percent decline in the nominal value of the dollar in the last 10 years. The government also may have to set aside some foreign exchange reserves to bailout the banking system if piles of loans to local governments and the property sector turn sour. China injected nearly US$80 billion in reserves into its big state banks from 2003 to 2008 to help them clean up their balance sheets so they could float shares. Meanwhile, China’s trade surplus, essentially the money it has to invest overseas, is shrinking as Beijing does what critics in the developed world have been urging for years and rebalances its economy away from exports. Imports surged 28.7 percent year on year in October and the surplus of US$17 billion was well short of the US$24.9 billion forecast by economists. Beijing holds an estimated one-quarter of its reserves in euro-denominated assets, so keeping that steady implies a US$117.5 billion increase this year if the country’s foreign exchange reserves grow by the US$470 billion estimated in 2011. That’s roughly the amount economists expect China to invest in Europe in 2012. “Assuming the FX reserve accumulation does not slow significantly, I think China will put at least US$80-100 billion in euro assets per year in the next two years,” said Wei Yao, China economist at Societe Generale in Hong Kong. China recycles foreign exchange assets into overseas investments so outflows of cash roughly track inflows. The build-up in FX reserves, a result of the central bank’s intervention to limit the yuan’s appreciation, tends to fuel inflation pressures even as the central bank issues bills to mop up the amount of local currency it pumps into the economy. And it explains why foreign reserves cannot easily be used for domestic spending on infrastructure or shoring up pension systems, since simply converting the cash risks driving up both inflation and the value of the yuan currency. This revelation comes hot on the heels of a similar one from a well-known Chinese economist and TV personality, who recently told a private audience that China is nearly bankrupt. Reducing the $1.2 trillion of discretionary spending cuts set to begin in 2013 may have “negative rating implications” for the U.S.’s top credit ranking, according to Moody’s Investors Service. The deficit reductions are to take place over 10 years and were triggered by a congressional panel’s failure this week to agree on alternative cuts of the same amount. Moody’s, which didn’t change the U.S.’s Aaa rating after the committee failed to reach agreement on Nov. 20, has a “negative outlook” on the country’s debt. Ummmm. About our $250 Billion debt ceiling. I wrote only yesterday that we are on track to hit it by mid-2012. Unless something went pear-shaped first. I was right. Something has gone pear-shaped. Julia Gillard has offered extra cash for the International Monetary Fund to help prop up the ailing European economy and prevent another global financial crisis. The prime minister made the offer as she arrived in France in the middle of a worsening European financial crisis that is set to dominate the Group of 20 nations meeting this week, The Courier-Mail reported. “For Australia’s part, we stand ready for an increase in IMF resources,” Ms Gillard said after arriving in Cannes. Australia’s Prime Minister Julia Gillard arrives in Cannes on a mission — she wants fellow G-20 governments to give more cash to the International Monetary Fund to help it deal with Europe’s crisis. “I will be raising the need to increase IMF resourcing, both at the G20 meeting itself, and at my bilateral meetings, starting today at my bilateral meeting with the President of Brazil,” Gillard tells reporters on her arrival in Cannes. Canberra has been a vocal advocate of the need to boost the IMF’s resources. The government has one of the developed world’s strongest sovereign balance sheets so is in a good position to donate more cash. A “good position” to donate more cash!?! “Good” compared to who, exactly? Greece? The USA? Zimbabwe? We only have a record budget deficit. Canberra is only borrowing money from foreigners at a record rate to fund Green-Labor’s insane spending … an extra $7 billion per month borrowed through September and October. And doing favours for foreigners … and foreign banks … assures politicians of a life of ease and comfort upon retiring or being kicked out of office. You are in a great position to throw bad money (borrowed) after even worse money (insolvent PIIGS). Let us be perfectly clear, dear reader. Europe is stuffed. Totally and utterly stuffed. As is the USA. The UK. Indeed, as is the entire Western world’s financial system. You simply can not fix a debt problem, by borrowing more money. History bares witness time and time again, that the so-called “rescue” packages that globalist entities like the IMF offer to over-indebted nations, are no rescue at all. In exchange for a non-solution – some “free” money, and “better” terms of repayment on existing debts owed – the IMF takes ownership over national infrastructure (ports, railways, toll roads, electricity grids, airports, etc) as collateral … and, effectively takes over dictating the national budget. Hence, “austerity measures”. It’s called “asset stripping” and “loss of sovereignty”. And it is beyond appalling to this blogger, that we have reached such a low point in the governance of Australia .. egged on by the general apathy of our citizens … that we now have a minority government that not only blatantly lies to and ignores the will of its people (carbon tax). Make no mistake, dear reader. By taking Australia ever deeper into record debt, this government is fast-tracking our nation into the arms of the IMF, World Bank, and other assorted power-crazed “We want to rule the world” lunatics. It could not be clearer where we are headed. 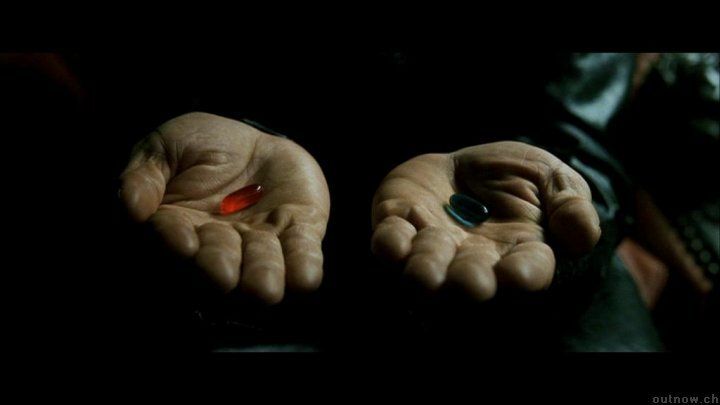 It’s time to take the Red Pill.